It began as book, became a series of books, and also a comic strip that the legendary Hal Foster left to start his own strip, Prince Valiant. Along the way there were a number of movies, including one with Buster Crabb, later to become Flash Gordon, and several radio shows. When television came along the Lord of the Jungle moved right on into yet another medium. 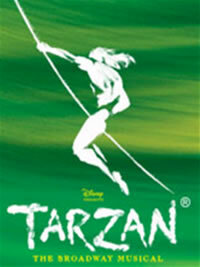 So it is with no great surprise that I learned that Tarzan, the musical, will open May tenth on Broadway. It is, of course, courtesy of the folks at Disney and the score has been built on the music from the animated film, which includes works by Phil Collins. It was with some surprise I learned that Josh Strickland, American Idol finalist, will be the man wearing the leopardskin loincloth and swinging on the vine. Now the big question is, not will he win Jane, but can he do The Yell? "Ahhhhheeeeeahhhhhh-eeeeeahhhhheeeeah!" Tickets on sale online for the Richard Rogers Theater.